The Doctor and Peri cross paths with the Doctor’s own past as they land on Earth in 2163, ten years after the Daleks have captured Earth and one year before the First Doctor puts an end to their occupation. As the Doctor finds himself amongst a burgeoning rebellion, though, he also finds himself a hostage to time as he knows that this rebellion must fail and that the Daleks must be allowed to succeed for another full year. 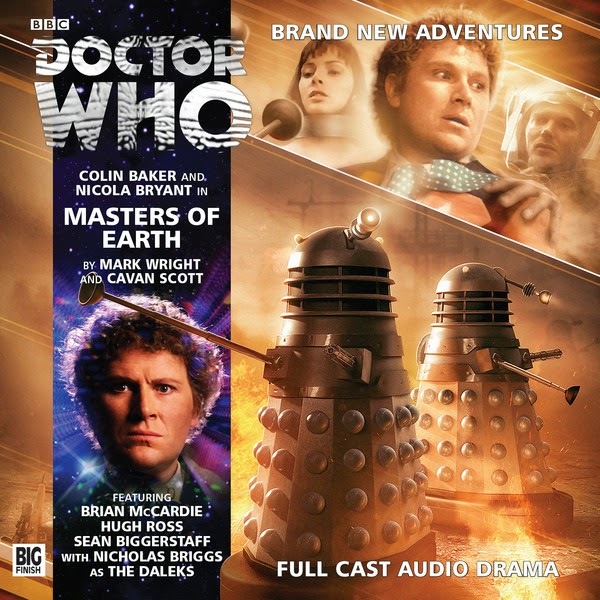 The pairing of Colin Baker’s Sixth Doctor and Nicola Bryant’s Peri is a true testament to everything Big Finish has accomplished, taking two somewhat controversial characters and making them utterly enthralling both separately and together. Especially given the harrowing experiences of Peri as portrayed in ‘The Widow’s Assassin,’ the character development and growth both have undergone in the audio medium has made this a must-hear team. With the stakes as high as they are here and the Doctor entangled in his own past which has yet to unfold, ‘Masters of Earth’ showcases the mutual respect and affection the two companions have for each other while furthering their understanding of each other as well. The Doctor is unable to get involved as he so desperately wants to, and his obligations to time’s sanctity force him to ask Peri to kill him rather than to allow the Daleks to gain information about him and his role in their eventual downfall. At the same time, though, Peri has developed into a much stronger woman than when she initially joined the TARDIS, unafraid to stand up to the Doctor’s seemingly dispassionate inaction and calling into question how much he has genuinely changed as he still gets others to do his dirty work. While it may seem odd to set a story during the occupation that ended in ‘The Dalek Invasion of Earth,’ it allows writers Cavan Scott and Mark Wright the opportunity to explore the human psychological response without having to necessarily focus on crafting a satisfying conclusion to the occupation itself. As such, more time can be spent with the human characters themselves to discover just how much human society has changed during the ten years under Dalek rule and how much it struggles to remain a semblance of its previous form. Even with the resistance movement growing, though, the Daleks retain their sly deviousness and have created an elite class of Robomen that more naturally mimic their human counterparts, hoping to infiltrate any resistance groups. Putting forth the notion of an island of safety that puts humans through a number of brutal tests to inadvertently prove themselves worthy of becoming elite Robomen is particularly clever, though obviously the notion of double agents works against both parties. Along with their plans to turn Earth into a traveling battle station that can shower other planets with the transformative Varga seeds, ‘Masters of Earth’ presents the Daleks as an exceedingly clever and strong force; even with the Doctor able to at the very least halt the elite Robomen portion of the Daleks’ strategy, the fact that the Doctor simply cannot win this particular battle at this particular time perfectly recaptures the powerful and ruthless essence of early televised Dalek appearances. Nobody will deny that the Daleks have suffered from overexposure in recent years, but ‘Masters of Earth’ manages to put a unique twist on well-trodden territory and to present a superb piece of drama that hearkens back to the height of Dalek popularity. The understanding but still tense relationship that the Doctor and Peri share after so long apart is a true highlight, and the revelation in the final episode that everything up until that point has been planned meticulously works exceedingly well to add yet another layer to this strong story. With thoroughly explored supporting characters and stunning direction and sound design, ‘Masters of Earth’ impresses on nearly every level, reaffirming this particular TARDIS team’s legacy in the process.